We are truly fortunate to have such a kind and knowledgeable teacher as Kushok Lobsang Dhamchöe in our midst. His warm heart and humorous teaching style attracts many new students from diverse backgrounds and cultures to join our Society's classes and retreats. His teachings on meditation, cultivating a warm heart, practising patience and many other aspects of Buddhist philosophy are in demand in meditation groups, educational institutions, yoga studios, corporate offices and support groups across Alberta. Kushok ’s intention is to always offer Buddha's Teachings wherever there is an interest. It is his life-long mission to honour his teachers and help preserve the culture, religion and philosophical traditions of Tibet. Kushok fulfills this personal commitment every day through his activities at Gaden Samten Ling the Society's Alberta Centre for Peace and Meditation and beyond. Kushok was orphaned at four years old. His aunt cared for him until he escaped from Tibet in 1963 with the help of his uncle. Kushok’s paternal uncle was Drakar Rinpoche Tendzin Norbu, the 16th reincarnation of the Drakar Rinpoches whose monastic lineage is a combination of Kagyu and Nyingma schools of Tibetan Buddhism. After Kushok’s uncle’s death, the 17th Drakar Rinpoche was discovered at the direction of the 16th Karmapa; he now resides in Kathmandu, Nepal. Kushok’s uncle’s lineage is revered and treasured, and is unique to the valley of Kyedong. Following his escape from Communist Chinese occupied Tibet, Kushok enrolled at Kalimpong Central School for Tibetans in India. He received his novice monk’s vows from the great Tibetan master Kyabje Song Rinpoche. After only a few years the school closed due to lack of funding and Kushok was left homeless. He spent several years working and living in Clementown, India before travelling to Dharamsala where he was accepted to join Namgyal Monastery, the personal non-sectarian monastery of His Holiness Tenzin Gyatso, the 14th Dalai Lama. Kushok’s primary teacher was His Eminence Lobsang Nyima Pal Sangpo, the 100th holder of the throne of Je Tsongkhapa – known as the Ganden Tripa. 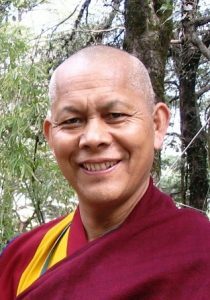 Following rigorous study, Kushok received his Geshe degree from the Council of Religious and Cultural Affairs of His Holiness the Dalai Lama in 1991, acknowledging his expertise in Buddhist scripture, ritual, philosophy, chanting, meditation, ritual dance, and the intricate arts of sand mandala and butter sculpture. In the year 2000, after 30 years of study and service to Namgyal Monastery, Kushok moved to Edmonton at the request of our Society to become the Society’s Spiritual Director. Since arriving in Edmonton he has worked unceasingly to advance the vision of the Society’s founding teacher, Geshe Ngawang Kaldän, The Society activities and membership have grown under his constant guidance and care. The Society's Alberta Centre for Peace and Meditation opened in 2012 and since opening, Kushok has introduced new courses including Meditation: A Path to Happiness and How to Practice, Seeds of Happiness (Meditation for Parents and Children), and much more. "Kushok" is a term of respect for monks from His Holiness the Dalai Lama’s monastery. The word officially means servant of the Dalai Lama and is reserved for monks from Namgyal Monastery. Kushok prefers to be called by this term of respect rather than by a personal name or another title.